The Baby is turning 4 months old this Friday and we're anxiously waiting to see what the Baby's favorite doctor, Dr. Sue Hubbard, to see what she has to say. We also get to see what's going to happen next with the clogged tear duct. Her left eye has gotten a lot better but her right eye is crusted shut every morning. 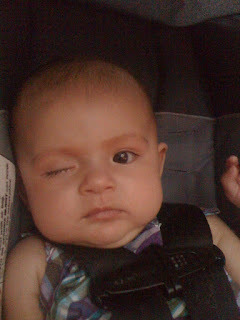 It doesn't bother her but it's kinda creepy to see her peer out from only one eye every morning. Of course turning 4 months means a lot of new discoveries. The Baby is flip fliopping around from her stomach to her back and vice versa. Usually babies get pissed off when they are on their stomach just because it's frustrating for them. But the Baby just likes to smile and laugh, probably because she is proud of herself when she flips around. And when she gets tired from trying to keep her head up, she just lays her head down and rests. The Baby has also discovered her toes and she loves them. I think she likes to grab them every ten seconds to make sure they are still there. She also still loves sucking on her fingers. I swear her fingers are just little bits of chocolatey goodness. She even shoves both hands into her mouth like its a pie eating contest. The Baby has also figured out how to make spit bubbles and it is getting pretty messy. But with the new discoveries, there also the ones that the Baby has moved on from and unfortunately her best friend the Ceiling Light are no longer on speaking terms. We used to be able to show her the light and she will be smiling and laughing but now she just completely ignores it. She is far too interested in other things, like a FIJI water bottle. She is amazed by this bottle. She doesn't talk to it, she just stares and stares. It's as if she was trying to burn a hole through it. I've also noticed myself making lots of baby faces to elicit a smile out of the Baby. But I seem to be doing it to random people too. Good thing I don't do baby talk, otherwise that could be disastrous. One of our friends just recently announced she was preggers with baby #2. We're happy for them. They have such an adorable and picturesque family and it got the Wifey and I talking. We both know the value of siblings and how it was nice to have one growing up. I go to my brother seeking advice and the Wifey's brother goes to her seeking alcohol. So siblings are essential and a valuable resource. But the Baby is such a good baby as it is. I would hate for the Wifey to give birth to a devil child, or more that I read about it....a normal baby. The Baby wakes up smiling and goes to sleep smiling. She loves it when you sing to her, even if you're like me and can't carry a tune. She smiles when you yell at her. She only fusses when she is tired or hungry. Oh well, we still have a quite awhile to sleep on it. 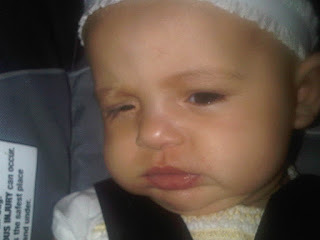 Here are some pictures of the Baby and her clogged tear duct.